Chris Boyd described Saints' victory against the Dragons as 'a mixed bag'. And the boss wants more from some of his players after admitting there were 'some average performances' in the thumping 48-14 success. 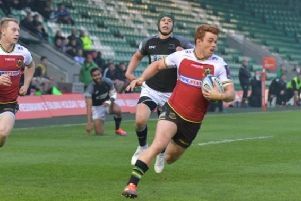 Saints scored eight tries to overcome the Welsh region, who had few answers to the home side in the Challenge Cup clash. It is the second time this season that the black, green and gold have beaten the Dragons with plenty to spare. And Boyd said: "It's about what we expected. "We were obviously keen to get a bonus-point win here at home for two reasons: one is because we were disappointed with the past couple of games (against Sale and Newcastle) and we also wanted to keep ourselves alive in this competition. "It was a mixed bag. "There were some good performances but there were also some average performances. "At this time of year, you hope to get more out of everybody but that's never what happens. Saints have now claimed 10 points from their opening three Challenge Cup matches, doing the double over Dragons after suffering a big home defeat to Clermont Auvergne. And Boyd, who takes his team to Romanian side Timisoara Saracens next Saturday, said: "We seem to be okay with the other teams but we got a bit of a dusting here against Clermont, who were playing pretty well. "We got a comfortable win and we'll battle to top the pool with Clermont. "Hopefully we can pick up enough points to put ourselves in a semi-final position."